Mdg Advertising gives us the scoop on how Facebook engagement and visibility, ad costs and traffic have all taken new directions since the changes. Discerning how technology companies are going to change their offerings is usually difficult. Most of the time, firms will make vague statements (e.g., Google) or remain completely silent (e.g., Apple). Why? Because he felt the News Feed had strayed from its mission. “Recently we’ve gotten feedback from our community that public content—posts from businesses, brands and media—is crowding out the personal moments that lead us to connect more with each other,” wrote Zuckerberg. Were those dire predictions right? Have the Facebook News Feed changes affected the performance of content, ads, and the platform itself? The biggest fear brands and publishers had about the News Feed shift is that their content would disappear completely. That has not happened. The initial data indicates that content visibility and engagement has dropped for some organizations and not for others. For example, an early analysis by The Western Journal shows a dip for some conservative publishers while a study by Poynter shows no impact for fact-checking websites. The clearest negative impact has been on “clickbait” pieces. What’s interesting is that this decline actually predates Zuckerberg’s announcement and began last year. 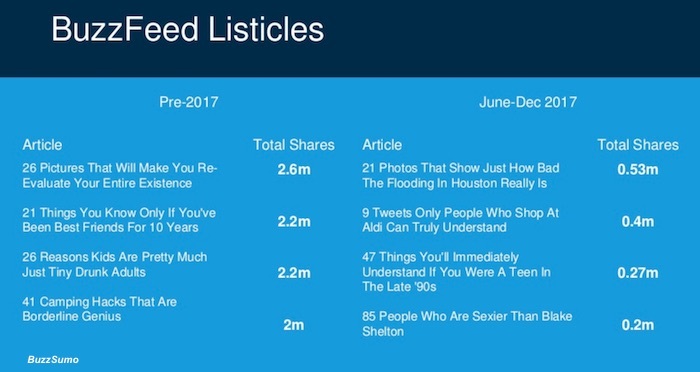 A BuzzSumo analysis shows that pre-2017 top BuzzFeed listicle posts were getting more than two million shares; after Facebook started making News Feed changes that plummeted to fewer than 500,000 shares. So, what’s going on? Facebook has been fairly transparent on this. Contrary to what was initially reported, the company isn’t hiding all content from publishers and brands. Rather, it’s doing two things: somewhat decreasing the number of public (brand/publisher) pieces while also prioritizing some types of content and deprioritizing others. Organic content visibility and engagement isn’t the only area that’s seen changes this year — advertising pricing has noticeably shifted as well. It seems that there’s been a decline in the number of ad impressions in 2018, which has had a natural supply-and-demand consequence: prices have gone up. According to AdStage data cited by Recode, the volume of Facebook ad impressions dropped in the first two months of 2018 and CPMs spiked by 122% year-over-year in January and 77% in February. This data comes from a small sample size and is only for a short period, so it doesn’t necessarily reflect what happened across all brands and advertisers. That said, it does seem to indicate a general trend toward an increased cost for paid Facebook engagement. The specifics of what’s driving the shift isn’t certain: the quantity and makeup of paid units may have changed, or there may be a broad drop in engagement, or some combination, or something else. What’s clear is that the News Feed changes seem to have either driven or coincided with a rise in costs for Facebook advertising. Another trend that has tracked the News Feed changes is a drop in referral traffic from Facebook. 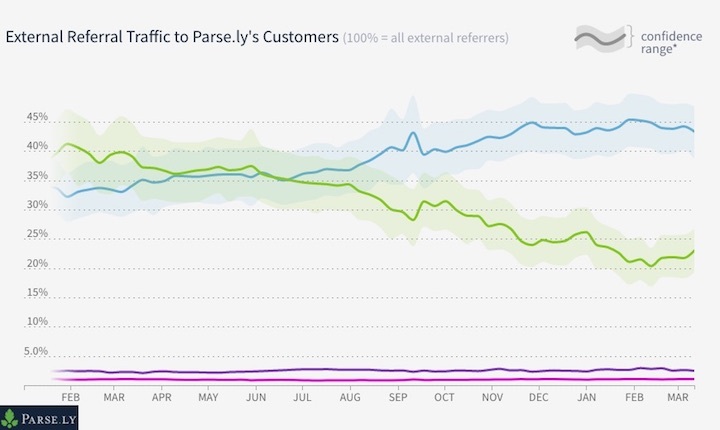 According to Parse.ly data, in May and June of 2017, Facebook actually drove more traffic to Parse.ly’s customers’ sites than Google search. However, that’s no longer the case. Now, Google search accounts for 44% of referrals and Facebook accounts for just 25% of referrals. Again, this dataset is relatively small and may not apply to all brands and verticals. However, as with ad pricing, it does seem to indicate an overall trend. Also as with ad pricing, the drop in referral traffic isn’t necessarily being driven fully by the News Feed changes. As WIRED points out, the decline also coincides with less engagement on some content after the U.S. election, the rise of Google’s AMP pages, and publishers scaling back their reliance on social distribution. So, what’s a marketer to make of all of this? The first learning is simple: don’t panic. While the News Feed changes have dramatically impacted some content—specifically clickbait and spammy pieces—they haven’t transformed the landscape. Views and interactions have gone up in some areas and down in others. For brands that are creating valuable content, Facebook remains an important outlet; it still has a scale and a level of engagement unmatched by any other social platform: some 68% of U.S. adults say they use it, and 74% visit at least once a day. All that said, it’s also clear that the Facebook platform is changing in significant ways. The mix of organic posts in the News Feed is shifting, ad prices are in flux, and the status of the platform as a driver of traffic to external properties is uncertain. Moreover, traditional metrics of success such as user base size and time spent aren’t trending upward for Facebook. In other words, Facebook is consciously shifting its focus, and is willing to endure some growing pains in order to do so. It’s possible, of course, that what emerges will be less friendly to brands, with fewer opportunities to distribute content and higher ad prices. But it’s also possible that the next iteration will be improved, with more engaged audiences and a wider range of valuable News Feed posts. Which way will things go? Only time will tell.